New Daft Punk Thomas and Guy papercraft paperkura models! 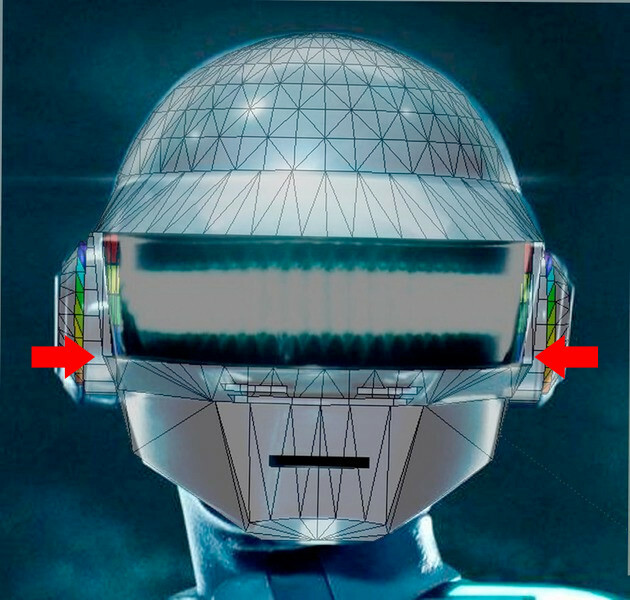 New 3d printable Daft Punk Thomas and Guy helmets! EDIT 2: you can get a Thomas cast from LE props! Almost all features of the 3d printed version, but much cheaper. Check him out on social media. Edit: well, i've decided to make this available through shapeways (go through the thread to see how it evolved). Their new pricing policy for some materials made it not worth the time, work and cost of assembling, hardening and sanding a paper model. Anyways, if you really want to go the paper way, send me a Personal Message that i'll send you the pepakura model ; ). Jump to this post to download Thomas' model. Some may know i'm modeling/improving 3d models for Guy and Thomas. I'm aiming at HAA era helmets, but also balancing some features to make the best of the helmets as they can be. Latter I'll also add the internal structures for the templates to house the light rigs, and have it unfold again. This way it will be easier to build the lights housing in scale after the helmets are ready. I've just built the last version, and for this updated one i'll make sure it's the easiest and fastest build possible. For now, stay with some pictures. Maybe by the weekend the first unfold (without the internal light rigs template) is already available. Last edited by brunoosti; 12th Nov 2018 at 21:43. Re: New Daft Punk Thomas and Guy papercraft paperkura models! Ive tried modelling them in 3D, but im more of an organic person myself. I prefer to create more stranger things and scenes. The dimensions look REALLY CLOSE. Like, really well done man. Well, hum.. this is the final render! I'm not chroming the 3d model because google sketchup isn't that fancy (i think). Also, it's made to be transported to paper, so, i'll start working on assembling it to make at least the colored paper model ready for next month. Either, this is not a high def model. The first pic (smothed model) is a sketchup tool that smooth the edges based on an angle parameter. So, there really isn't a lot of polygons on this. On the second pic you can see the true polygon mesh. Might even try and re-create the grammy style visor with it too. Would it be possible to get a picture of your model at this angle? Very excited to see your Guy-Man! I'm not at home right now. I'll do the comparison and than post here. I'm not a professional, either at 3d modeling or prop making. It would be cool to have this rendered in high def. I'd like to get it 3d printed, but it's very much expensive : ( Also, i don't think it would have a great finish, because of the low res model. There is also the issue that the model has to have some thickness to it, so as the printer can lay the material. It's a lot of work to give those faces some thickness (i think 2-3mm would be more than enough). Baed on what I've seen this is my only real critique. Its a small one. I think the bottom corners of the visor could come a little closer together, but without changing the over all shape of the helmet. Does that make sense? Another way to say it is, I think the bottom of the visor should be a little narrower. That, and maybe the nostrils could be a hair smaller as well? Regardless, you've got a pretty spot on model there man, great work! yep, i've noticed that before and tried to narrow it, but it always end up with a to cone'y helmet. I don't know if the bottom part of the visor has a smaller radios than the top part or if that effect is achieved by the end frame inclination. Also could be a field of view/lenss effect, that would distort the image. From de 3d model>paperkura to chromed build - efficient tips? ?